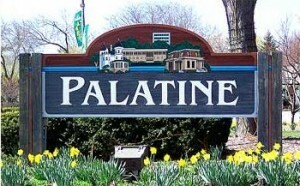 Located just 30 miles from Chicago’s Loop and 14 miles from O’Hare International Airport, Palatine puts metropolitan cultural and business advantages within easy reach, while providing an away-from-it-all home town feeling for its residents. As of the 2000 census, the village had a total population of 65,479. In the 2010 census its population had risen to 68,557, making it the seventh-largest community in Cook County and the 18th-largest in the state of Illinois. A pleasant mix of residential, commercial, light industrial and office space, surrounded by parks and open space, provide Palatine with a solid tax base and a tranquil atmosphere.